Background and Aim: Honey is a natural substance with various medicinal properties which include antibacterial, antihypertensive, hepatoprotective, hypoglycemic and antioxidant effects. However, the role of honey in the management of neuropathic morbidities in diabetic neuropathy has not been studied. Especially, the effect of honey on fasting blood glucose and lipid profile in diabetic neuropathy has not been assessed. Therefore, in the present study we have assessed the effect of honey treatment on blood glucose and lipid profile in animal diabetic neuropathy model. Methods: Twenty-four healthy male Wistar albino rats of 10-12 weeks age, weighing 200±30 g were obtained from JIPMER central animal house. After one week of habituation, rats were divided into three groups randomly. After developing diabetic neuropathy, Fasting Blood Glucose (FBG) and lipid profile, Aspartate Transaminase (AST) and Alanine transaminase (ALT) were measured in blood sample in the rats before and after honey treatment. Results: Significant increase in FBG, AST, ALT and lipid profile except HDL cholesterol was seen in diabetic neuropathy when compared with normal healthy rats. There was a significant reduction in all these parameters except HDL-cholesterol after four-week honey treatment in comparison with diabetic neuropathy rats without treatment. 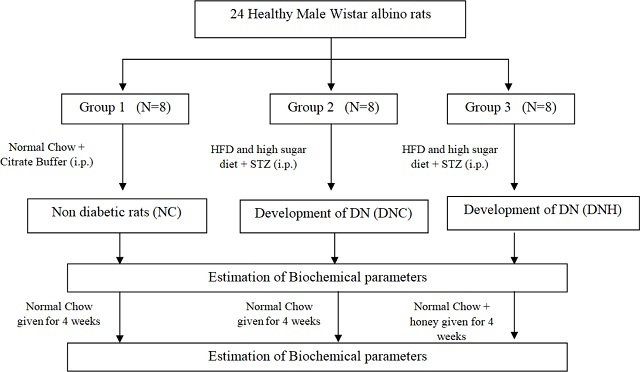 Conclusion: Honey, given at a dose of 0.5 gm/kg BW for four weeks is effective in reducing blood glucose, atherogenic index and lipid profile and improving liver functions in albino rats.